B24 - Nosferatus Hand in Belts, Buckles & Gloves is made for Women and Men and comes in Pewter, Red and is made of Pewter material. It is marked as BeltBuckles and weighs about 1.00 lb. 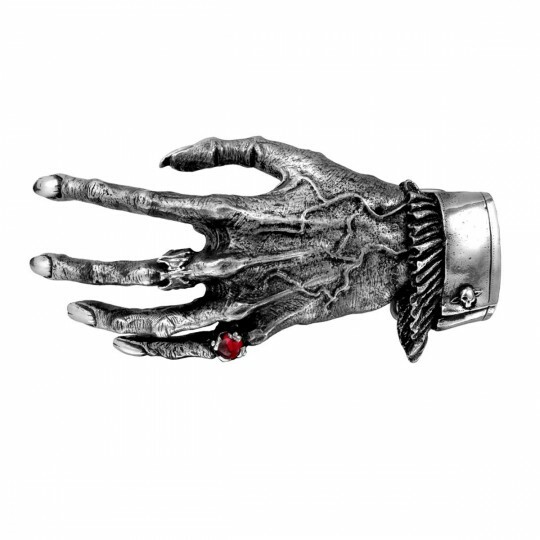 The withered, yet living hand of the infamous undead, insensitively embraces the strap; in dark pewter with polished highlights and red cabochon ring. Width 6.3 x Height 2.95 x Depth 1.18 Approx.